Iowa Car Accident Spinal Cord Injuries and Recoveries | Hupy and Abraham, S.C.
A spinal cord injury can instantly change your life. In the moments before the accident you may have been living without a physical disability, but the instant the crash happened your condition may have permanently changed. The injury you sustained to your spinal cord could have forever changed your life. Spinal cord injuries are typically classified as either incomplete spinal cord injuries or complete spinal cord injuries. Anterior cord syndrome: This is an injury to the front of the spinal cord. 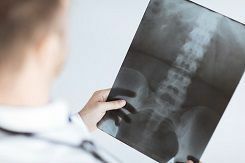 Often, car accident victims with an anterior spinal cord injury suffer from loss of muscle function below the point of the spinal cord that was injured. However, since the middle and back of the spinal cord were not injured, accident victims may retain some sensation below the point of injury. Central cord syndrome: Sometimes only the middle part of the spinal cord is injured. This may occur in a car crash if the neck is hyperextended during the collision. Paralysis of part of the body—most typically the arms and hands—may occur. Partial loss of sensation and loss of bladder control can also result from this injury. Posterior cord syndrome: An injury to the back of the spinal cord injury is known as posterior cord syndrome. This is less common than anterior cord syndrome or central cord syndrome, but it may occur. Car accident victims who suffer this type of injury may lose sensation but retain motor functions below the point of injury. Brown-Sequard syndrome: Not all spinal cord injuries occur in the front, middle, or back of the spinal cord. People who suffer Brown-Sequard syndrome suffer an injury either to the right or the left side of the spinal cord. They may be paralyzed on the same side of the body as the spinal cord injury, but retain movement on the other side of the body. The other side of the body may experience loss of sensation, however. Cauda equina lesion: This type of injury occurs when the nerves at the base of the spine are compressed. Immediate surgery may help prevent lasting paralysis of the legs, feet and pelvic muscles. Complete Paraplegia: This type of injury occurs when the front, middle, and back of the spinal cord are injured on both the left and right sides at the T1 level or lower. Typically, people with this serious injury retain use of their arms and hands, but lose motor and sensory function in the lower half of their bodies. Complete Tetraplegia: This type of injury also occurs when the front, middle, and back of the spinal cord are injured on both the left and right sides. However, it occurs higher up on the spinal cord. People with this devastating injury lose motor and sensory function from the point of injury down and may be unable to breathe or speak on their own. They also lose motor and sensory function in most of their bodies including their trunk, arms and legs. A doctor can help you determine what type of spinal cord injury you’ve suffered and what your treatment plan should be going forward. Currently, treatment may help with the symptoms of a spinal cord injury, but there is no cure. Yet people with spinal cord injuries may be able to lead productive lives with rehabilitation therapies and assistance. Medical professionals are also optimistic that someday there will be a cure for spinal cord injuries. Accordingly, it is important to fight for your physical and legal recoveries and to have all of the resources that you need to recover as completely as possible. To find out more about how to protect your rights, please start a live chat with us and schedule your free consultation with an experienced attorney today.